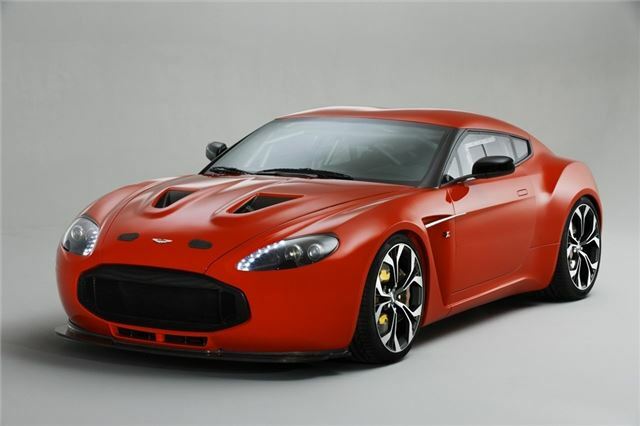 Aston Martin has confirmed that it will put the V12 Zagato road car into production in 2012 - with an eye watering price tag of £330,000. Just 150 examples of the stunning supercar will be built ensuring exclusivity and pretty good residuals. The new model, based on the V12 Vantage, will be hand assembled as Aston's headquarters in Gaydon, Warwickshire and features a handcrafted aluminium and carbon fibre body of which every pane is formed using an English wheel and traditionally crafted body bucks. Iconic Zagato design cues include the double bubble roof, which is made up of five separate pieces. Designed for the focused driver, the V12 Zagato has been set-up with pure driving enjoyment in mind. The V12 Zagato combines Aston Martin’s most dynamic bonded aluminium platform with the power of the 6.0-litre V12 engine producing 510 bhp (517 PS) and 570 Nm of torque. In honour of the performance and racing heritage of previous collaborations, the first two V12 Zagatos were developed as endurance race cars from the start and went into their track debut just a week after being shown to the public for the first time on the shores of Lake Como, Italy at the Villa D’Este Concours where it won the award for Design in the Concepts and Prototypes class. Entering the new V12 Zagatos in this year’s Nürburgring 24 Hour extended the company’s racing philosophy at the famous circuit. For five years Aston Martin has signed-off its new products by entering a car which is as close to the road car as possible and subjecting it to the toughest 24 hour test on what best simulates the extremities of public roads. This year went a step further by testing two cars at their prototype stage; combining forces to successfully cover more than 230 laps and over 3,700 miles in the 24 hour race at what Sir Jackie Stewart famously called ‘The Green Hell’.